I’m going to start off with a high-level itinerary and then link to posts with more detail. 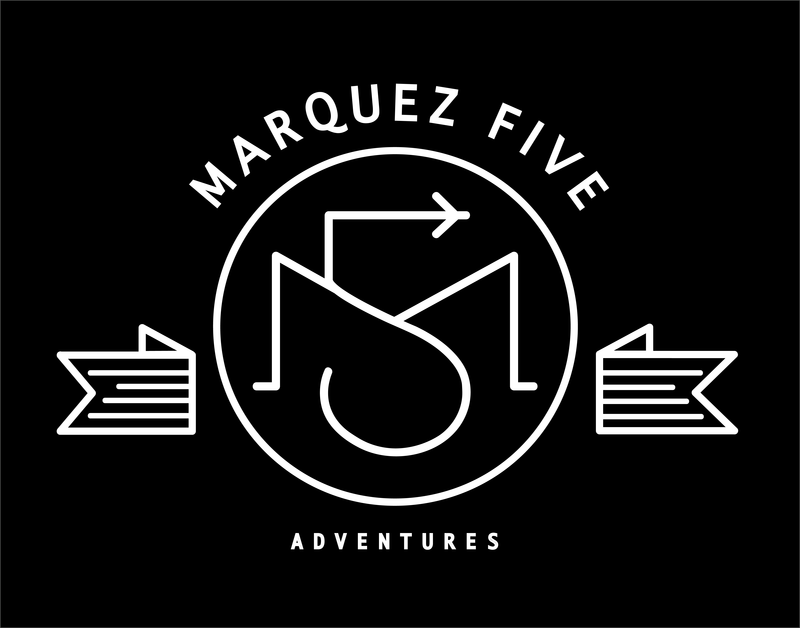 If you’re looking for more detail on a particular piece of our trip, let me know and I’ll add those posts first. I also had a lot of “Aha!” moments on this trip regarding the way we travel which I think I’ll write about at some point. This trip raised some questions for us. For example, What’s the right amount of time to spend at each stop? Is it better to travel slowly and feel like you see everything in a few stops, or is it better to make more stops realizing you may not see everything on your list? We’ve done it both ways and maybe the answer is: it depends. We had multiple options of where to stop on our way to Thailand and I chose Hong Kong since my dad used to live there and I hadn’t been since the early 90s! Hong Kong was my first international trip when I was 14 and honestly I wasn’t a fan at the time. But now 25 years later, it held a special place in my heart and I was eager to go back and see it again. Much of it was the same, but so much was different. For starters, this was my first time landing at the new airport – my memory is of landing at Kai Tak airport and being so close to the apartment buildings that we could essentially look in and see people in their homes as we flew by on approach to the runway – scary! But walking the streets, seeing the markets, and breathing in the smells really brought back fond memories for me. I had wanted to see many of the places we went years before, but logistically it was hard given our short amount of time there. I would love to go back again and take a deeper look. We flew on United from San Francisco directly to Hong Kong (14 hours). We used Mike’s global upgrades to sit in Polaris Business Class which was SO worth it! We had lie-flat seats so we were all able to get some sleep on the flight. We left San Francisco at 1:30PM and arrived in Hong Kong the following day at 6:45PM. By the time we got to our hotel and ate dinner we were all exhausted and went to sleep easily though we were all up at 3AM the next morning ready to go! We stayed at the Peninsula Hong Kong in Kowloon. We were about a 5 minute walk to the Star Ferry which we rode to Hong Kong Island. It was so easy and the kids loved riding the ferry. Our kids loved the hotel that had iPads that controlled everything in our room (from the light switches and call buttons to opening & closing the curtains). There was a fabulous breakfast buffet, a gorgeous pool with views of Hong Kong, a spa (we only used the hot tub and sauna), and great restaurants on site. The Tsim Sha Tsui Star Ferry terminal was a 5 minute walk from the Peninsula hotel. 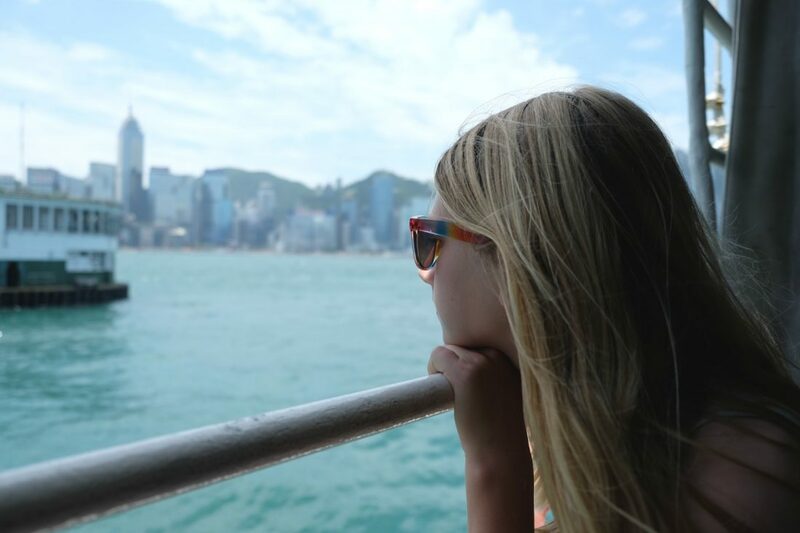 We bought tickets to the Central Pier on Hong Kong Island. This ride on the iconic ferry only took about 10 minutes and we had great views of Victoria Harbor and the skyline the entire way. 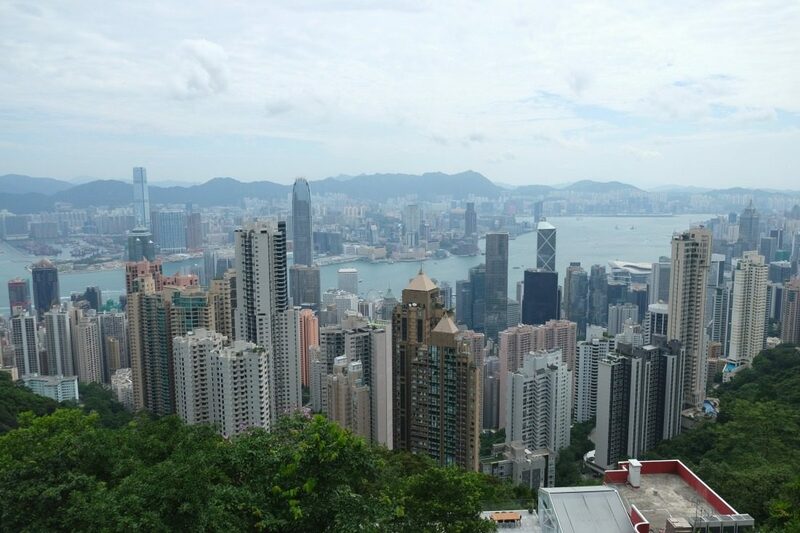 Since we were up and ready to go so early, we decided to head to Victoria Peak before the crowds. There are several ways to get to the top: taxi, bus, walk, or the Peak Tram. 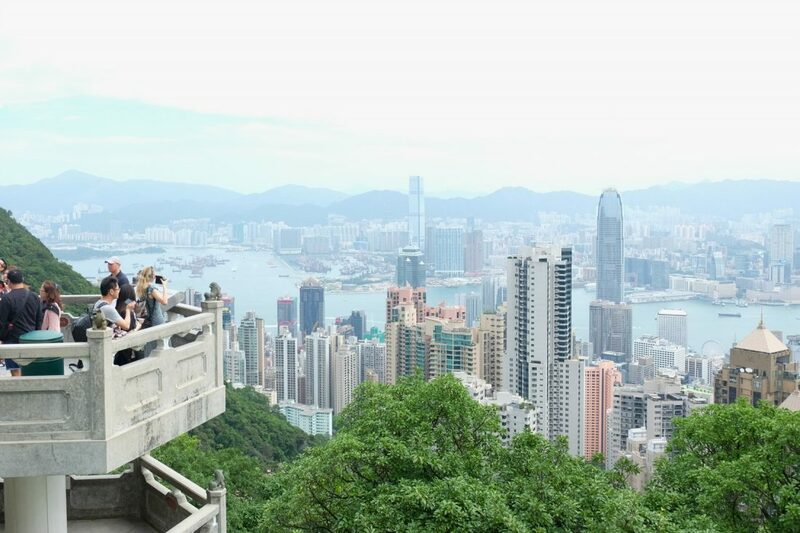 We chose to ride the Peak Tram which is a funicular railway that pulls you up the mountain by a single cable at an almost vertical angle. We passed by lots of housing and greenery before we emerged at the top. We chose not to add on a trip to the Observation Deck which I wasn’t sure if I’d regret or not, but the views from the lookout points were spectacular and we didn’t feel like we were missing out. There are restaurants at the top with good views. We thought we might stay and enjoy the view, but we were there so early we weren’t hungry yet. So we enjoyed the views and then headed back down. Our wait times (5 minutes?) were minimal up & down. By the time we got back to the bottom around 10AM, the line for the tram was significantly longer. So I’d try to get to the tram early or skip it altogether and take a taxi instead. 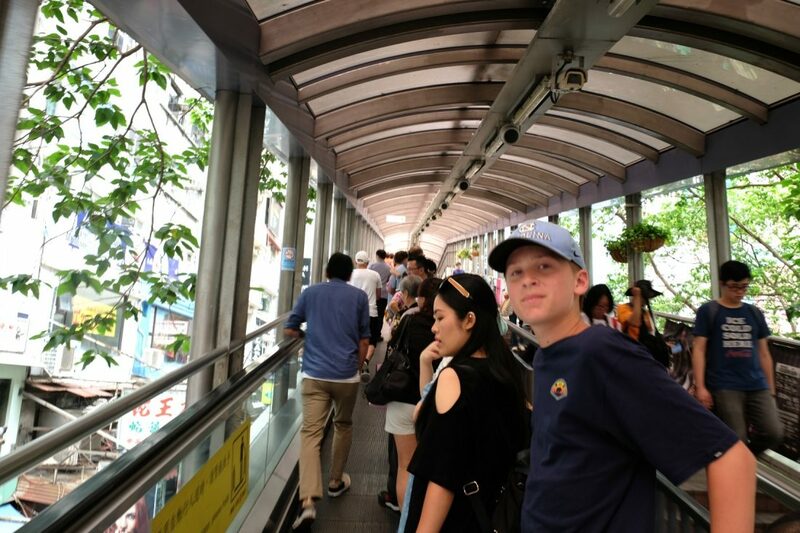 The Central Mid-Level Escalator is the longest outdoor covered escalator system in the world. They cover 800 meters in distance, elevate 135 meters and were built to provide a better commute between the mid-level hilly areas with the Central district. It’s not one continuous escalator, but rather a series of 20 escalators and 3 moving walkways that carry 85,000 people per day. The system has 14 entrances & exits. We rode the escalators about halfway and got off on Hollywood Road to visit Man Mo Temple. 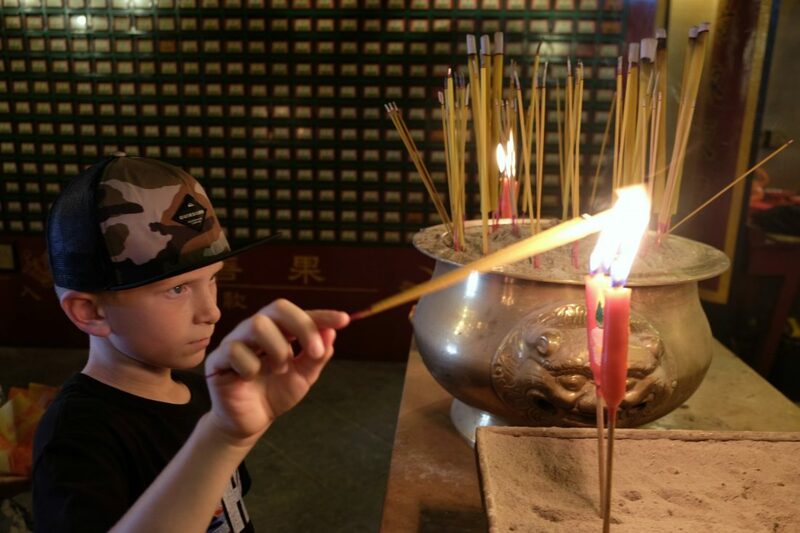 Man Mo Temple is located in the financial district and is a pleasant contrast from the hectic pace around it. The temple is a tribute to the God of Literature (Man) and the God of War (Mo). We went in and after admiring the interior lit some incense and said a prayer. 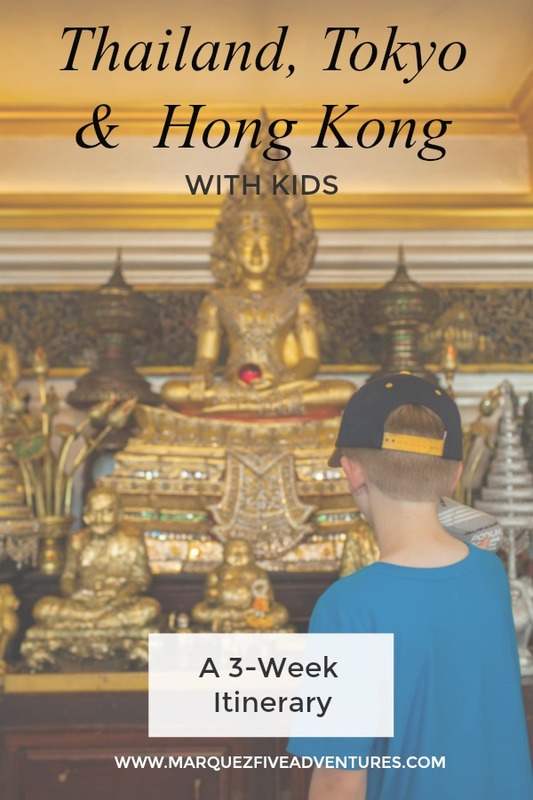 We were going to head to a nearby Dim Sum at Tim Ho Wan that had been recommended to us, but the kids were feeling jet lag and not yet used to the heat & humidity and were losing steam quickly. So we decided to head back to our hotel for a swim and afternoon tea. The Peninsula is arguably one of the best, if not the best, place to get afternoon tea in Hong Kong. Lucky for us it was in the lobby of our hotel so we couldn’t not go. Tea is served between 1-6PM and they do not take reservations so a queue begins to form early and lasts all afternoon. As guests of the hotel, we were able to make a reservation so we went for a swim and then headed down and skipped right to the front of the line. The menu for both food & tea is expansive and, because we had skipped lunch and were starving, got a little carried away ordering food that completely filled the table! We were also exhausted so maybe didn’t enjoy the experience as much as we had hoped as the service was not rushed (not necessarily a bad thing), and our kids didn’t have the patience to sit for very long. Our 8-year-old fell asleep at the table as soon as the food arrived (he also routinely fell asleep at dinner each night for the first 4 days). I kept wondering why my dad hadn’t taken my sister and me to see the iconic Big Buddha when we visited back in 1990, but then I realized it didn’t open until after my dad moved away! I was really excited to visit and for the adventure to get there. 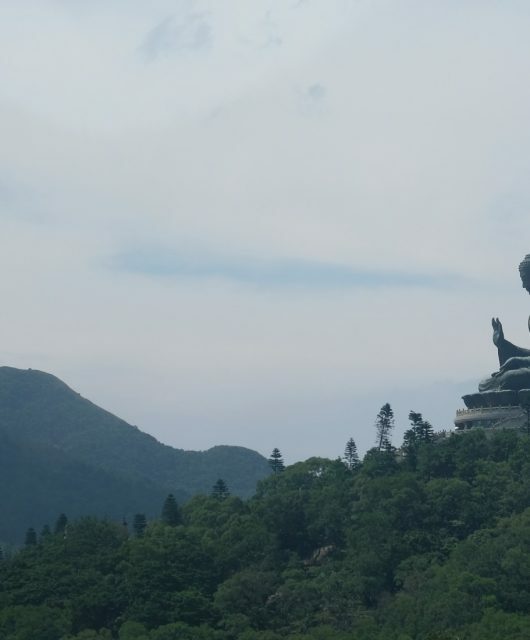 We started by taking the Tung Chung MTR line to the last stop and then rode the Ngong Ping cable car to Big Buddha on Lantau Island. 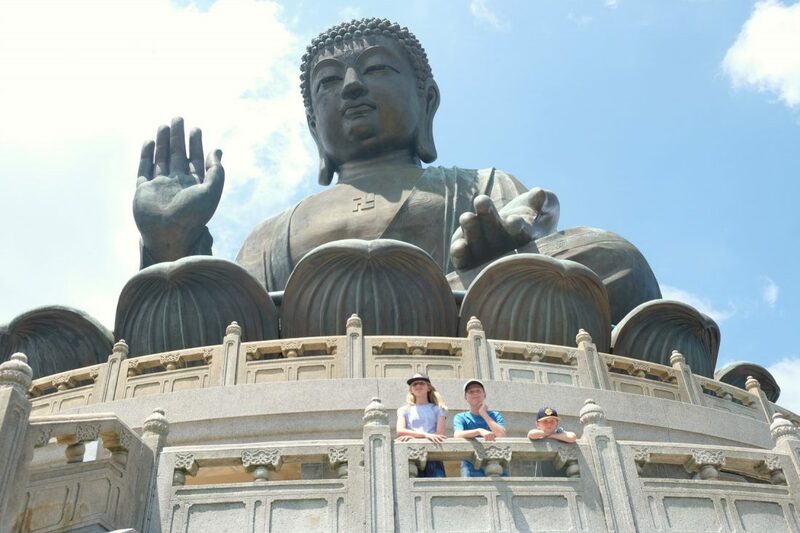 We explored all around the Buddha and learned why & how it was built, enjoyed the views and then took the tree-covered trail leading to the Wisdom Path. Big Buddha was really crowded, but we had the side trails and Wisdom Path mostly to ourselves. There were many other trails and hikes to do around the island which would have been fun, but we were still dealing with jet-lagged kids and had a long way back to our hotel. So we had lunch & ice cream at the village near the cable car and then headed home. We were lucky to be there on such a beautiful and clear day. The views from the cable car & Lantau Island were beautiful, and I loved the views of the airport and watching all the planes land & takeoff as we slowly rode by on the cable car. This was another day where we were up early so we got to the cable car around 9AM and there was virtually no line. We had received vouchers from our hotel concierge for the cable car to save time waiting in line, but there was actually a longer line (2 people) to redeem our vouchers than the one for those purchasing tickets (no line!). However, by the time we returned around 2PM the line was massive and I suspect it would have taken at least an hour to get through to the ticket window and then additional time to wait for the cable car. We were all so glad we had gone early in the day! Read the entire post on our day trip to Big Buddha here. We flew Cathay Pacific direct from Hong Kong to Bangkok. This was our only delayed flight of the trip. We were supposed to land in Bangkok around 4PM and our plan was to go swimming and have dinner once we arrived at the hotel. By the time we got to the hotel it was dark and we were all exhausted and starving. We ordered room service and went to bed! 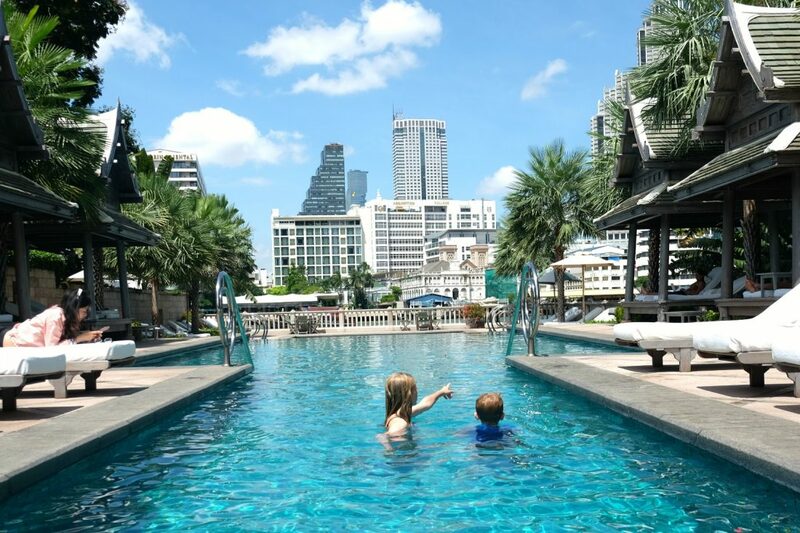 We stayed at the Peninsula Bangkok which is now one of my favorite hotels ever. There was just something magical about this hotel that sits on the Chao Phraya river. The breakfast buffet on the patio that overlooks the river was the best buffet (and coffee) of our trip and possibly the best buffet we’ve had. Ever. We loved sitting outside watching the morning boat traffic go up & down the river. The three-tiered pool was gorgeous with views of the river. The staff was so friendly and helpful. And the Royal Thai massage at the spa was both painful and amazing at the same time! 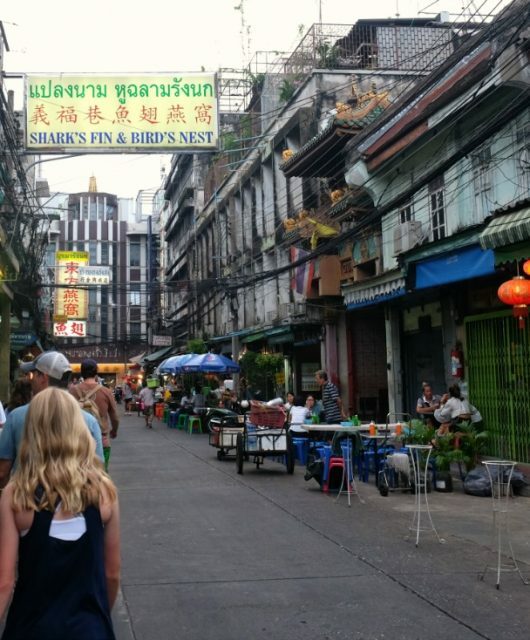 With only 2 days in Bangkok, we wanted to make the most of our time so we signed up for a walking tour with Context Travel. We met our guide, Ren, at a metro stop at 10AM and spent the next 6 hours with him (even though our tour was only supposed to be 4 hours). He took us to some spots we might not otherwise have found and helped us navigate our way around town via commuter ferries and tuk tuks. He also gave us a lot of history about what we were seeing (and Bangkok & Thailand in general). He was very patient with our kids as they warmed up to him and asked him many many questions. They seemed most interested in the King and Royal family and the Thai customs. Read the entire post on our tour with Context Travel & Flytographer here. Mike and I were eager to try out the Royal Thai Massage at the hotel so we signed the kids up for a cooking class to occupy them while we went to the spa. Even though this class was technically for kids under 12, they allowed our 13-year-old to join in as well. It was just the 3 of them so it ended up working out fine as he didn’t feel “too old”. 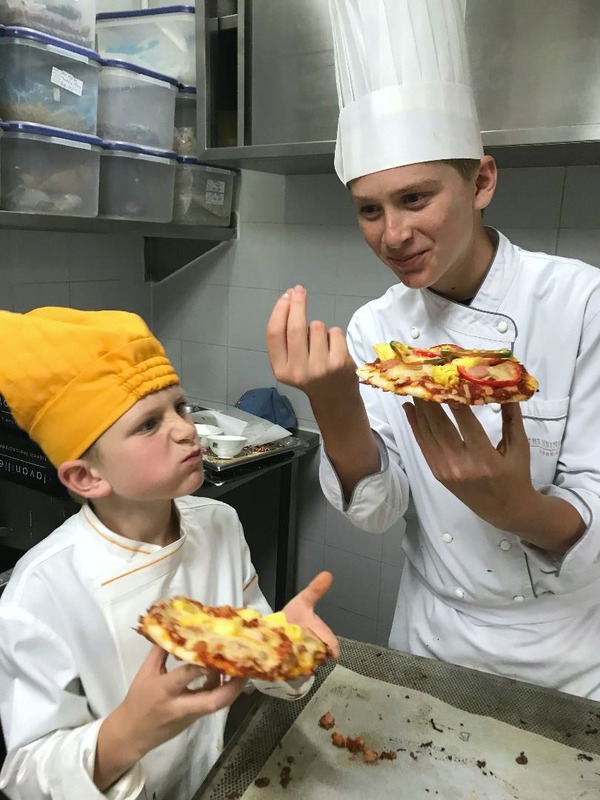 We all would have liked for them to try out some Thai cooking, but the options they had for this class were: pizza, brownies, cupcakes, cookies – the kids got to choose 2 and agreed on pizza & brownies. They had a great time and came away with all their goodies and a completion certificate. The instructors also shared a bunch of pictures they took. 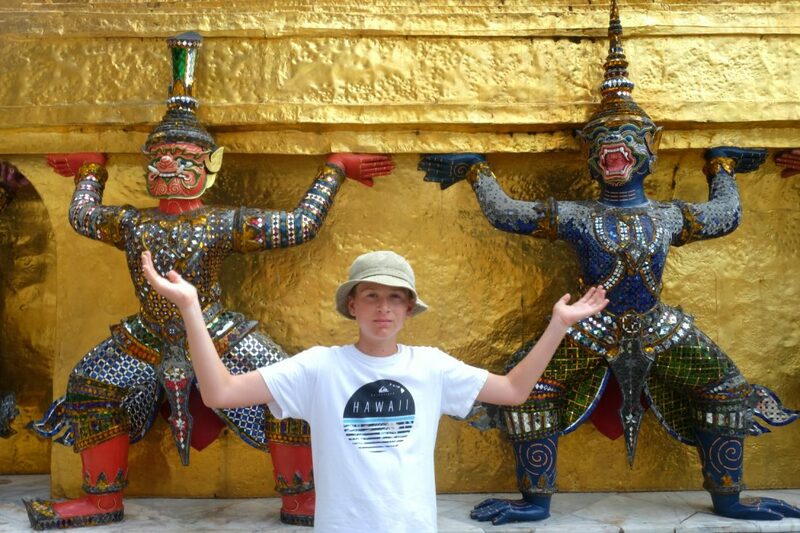 I felt like we couldn’t go to Bangkok and not visit the Grand Palace. The architecture and intricate details on the temples and buildings are unbelievable. But, it was crowded! We had been advised by Ren to plan our visit around 2PM after all the Chinese tour buses have passed through, but it worked better for our schedule to go in the morning. We had hoped to join in on one of their English-led tours, but they were cancelled that day because the English-speaking guide was out. So we navigated the crowds as best we could and relied on the guide we picked up there as well as the information that was in my book. But I don’t think we got everything out of that visit that we could have. They had audio sets at the entrance that would have been great, however, one thing I wasn’t expecting was that not many vendors only took cash, no credit cards. It cost 500 baht/person to enter and then we didn’t have enough cash left over for the audio sets since we needed to save money for the other stops we had planned. 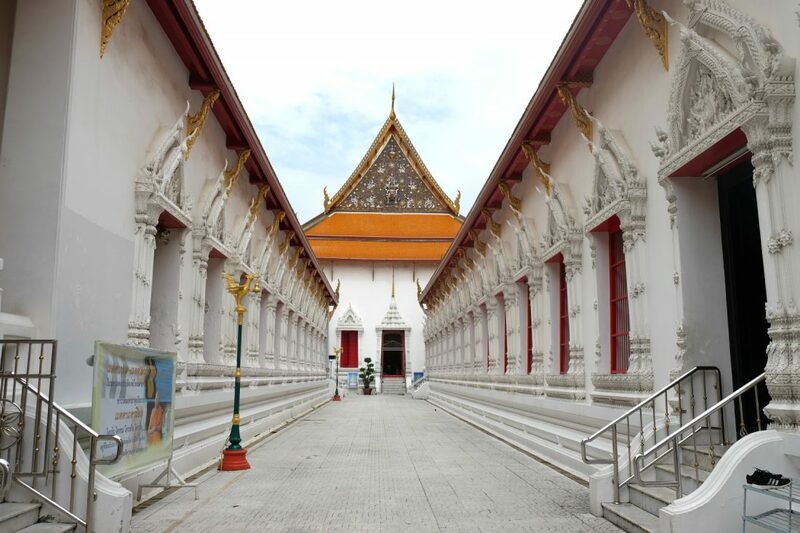 Wat Pho is the oldest and largest temple complex in Bangkok. 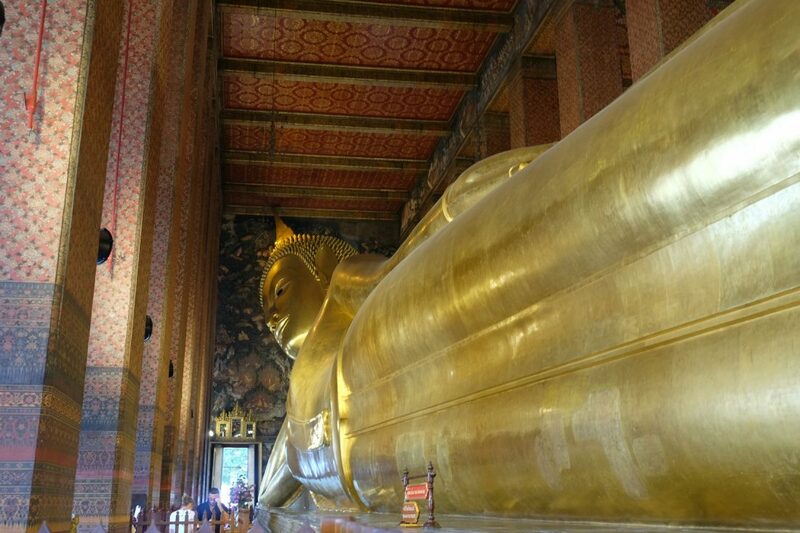 The entire complex has a wonderful collection of religious structures, rock gardens, bell towers and stupas, but we went straight for the Reclining Buddha (it was hot and our kids were already tired from the Grand Palace). They didn’t really want to see another temple, but once we got there they were blown away by the grandness of the Buddha. This was definitely the highlight of our time in Bangkok!  I was hesitant to book it because the kids aren’t super adventurous eaters, but I read great views about A Chef’s Tour and decided we’d just do it. I’m so glad we did. We met Chef Nuth in Chinatown for a 16 course tour. We sampled snacks, drinks, noodle dishes, seafood, desserts and an unexpected course…..insects! Chef Nuth grew up eating at many of these same places and had known some of the vendors for decades. We absolutely loved learning about all the foods and we never would have found any of these places without him. 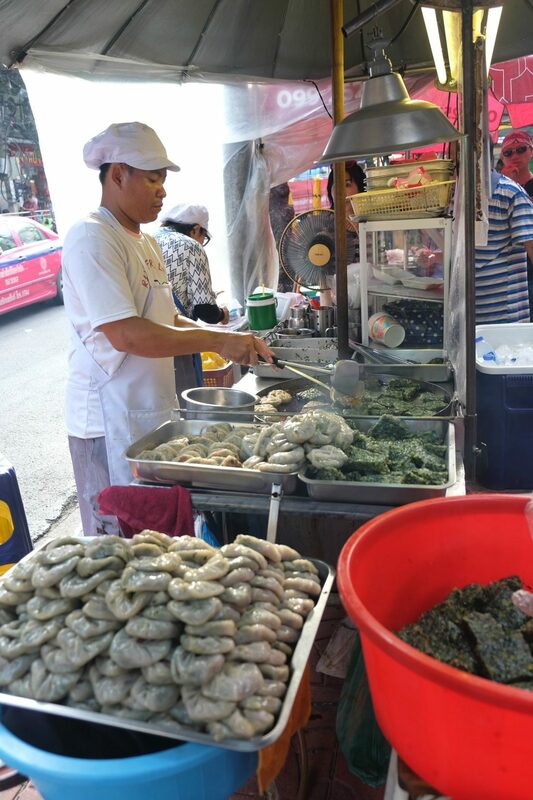 We felt like this tour got us off the tourist track and helped us to see a more authentic side of Bangkok. We left Bangkok first thing in the morning and arrived in Chiang Mai at 11AM. There are many airlines that fly within Thailand and most of them have ridiculously low fares – for each of our internal flights we paid about $30 per person per flight. We flew exclusively on Thai Airways or Thai Smile which are part of United’s Star Alliance so we could accumulate miles. Whenever we travel to foreign countries I always do a lot of research on foreign airlines to make sure they meet my safety standards – not all of the regional airlines did. 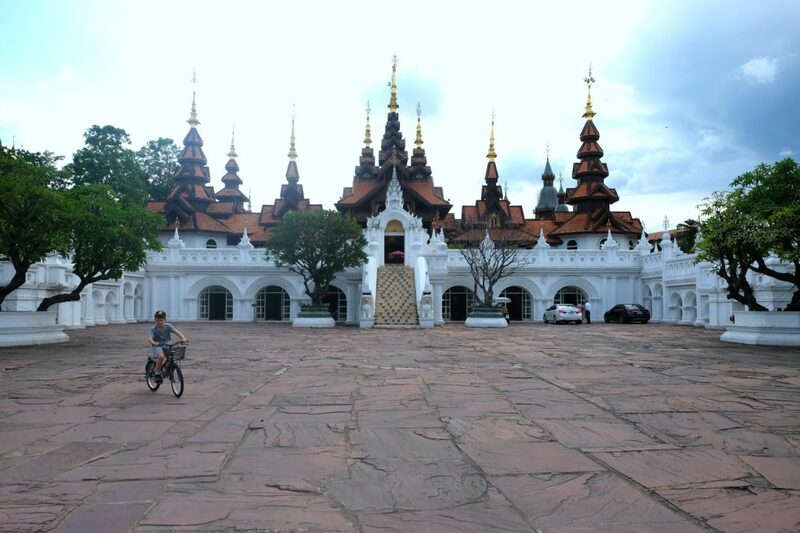 The Dhara Dhevi in Chiang Mai was absolutely the most over-the-top hotel we have ever stayed at. We stayed in a 2-bedroom villa with 2 living rooms, a kitchen, 4 bathrooms, 3 outdoor showers, a private pool and hot tub, patios, decks and a grass area overlooking rice paddies. It was completely fabulous, but what blew us away were the hotel grounds. Set on 55-acres, we felt like we were living in an ancient Thai village with winding paths, ancient buildings & temples, fountains, rice paddies – and it felt like we pretty much had them all to ourselves. We picked up complimentary bikes at the fitness center and used them all week to get around the property. We occasionally ran into people at the main pool and there were usually a few other occupied tables at breakfast, but that was about it. The food in Thailand isn’t just delicious, it’s also beautiful! We signed up for a fruit carving class with Boom who runs a travel agency but does fruit carving classes on the side. Some of the hotels we stayed at ran similar classes, but we really enjoyed the class with Boom. She was such a patient teacher, showing us how to make increasingly difficult cuts with each new fruit or vegetable we tried. 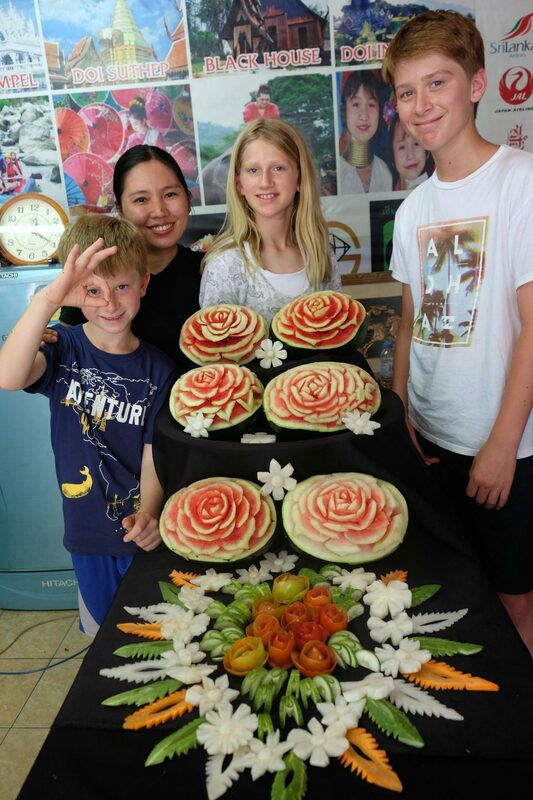 The grand finale was a whole watermelon carved into a flower – and we all pulled it off! In the end, Boom helped us to arrange all of our carvings into a big display which we were all incredibly proud of! Not bad for a couple of hours of work. I will definitely add a separate post here because a lot of thought went into our decision to visit this particular park AND it was such an incredible day. A van picked us up at our hotel at 8:30AM and drove us 90 minutes to the park. When we arrived we were immediately taken to several large buckets full of fruits that we got to feed to one hungry elephant. We had 2 elephant walks with our group which included a very knowledgeable guide and 6 other tourists. 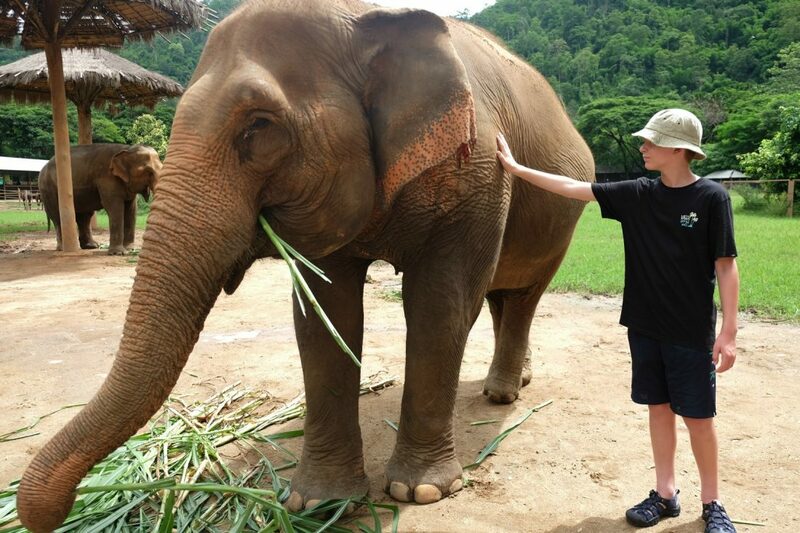 We walked freely among the elephants and were able to pet some of them who would tolerate it. Our guide told us the story of each elephant we met, her name and how old she was. He also told us about which ones were friends, which ones liked to be left alone and why. 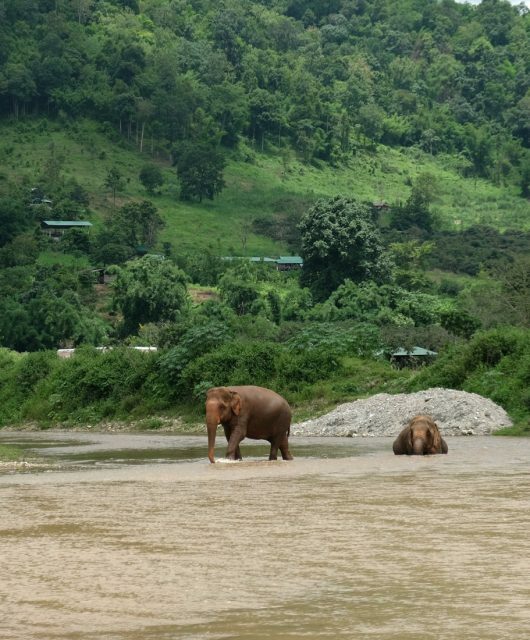 Although most of the elephants we met were happy and recovering, many of their histories were tragic. It was wonderful to see them roaming the open land, bathing in the river, playing with each other, and eating plentiful food. Doi Suthep overlooks the city of Chiang Mai from high atop a mountain and is one of Thailand’s most sacred temples. It was built in 1383 to enshrine a piece of bone said to be from the historical Buddha and is reached by climbing 306 stairs flanked by naga (serpents). Once at the top there are shrines, rock gardens, monuments and expansive views of the city. Walking into the inner courtyard, we paid our respects to a guardian dragon named “Mom”! 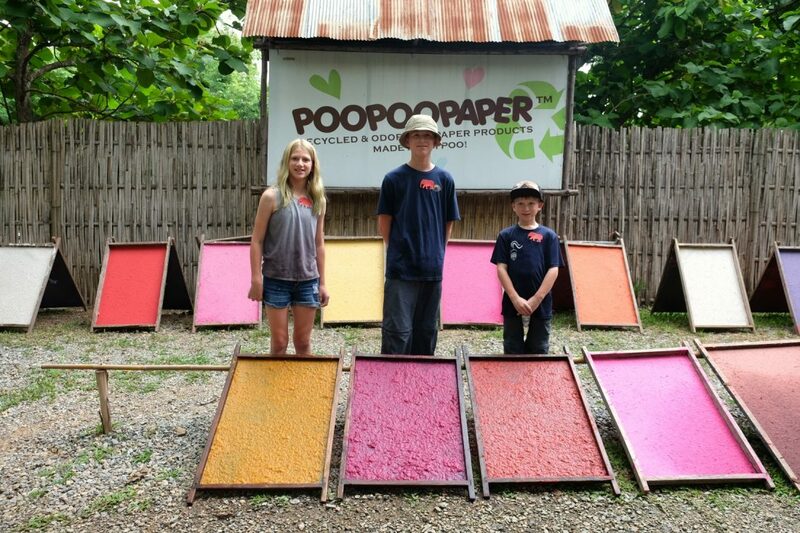 Once our kids heard about this place there was no option but to take them! It was definitely worth a visit to learn about the process of making paper. A docent walked us through each step in the paper making process which corresponded to a hands on station. There was a craft station at the end where we could purchase different poo poo paper products (notecards, notebooks, bookmarks, boxes, etc) and decorate them with paper cutouts. The kids and I spent a lot of time decorating various keepsakes to take home. 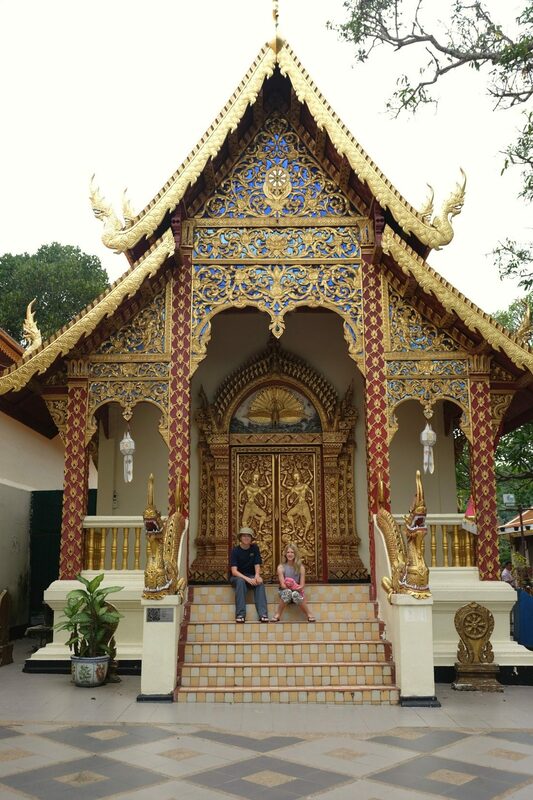 By the time we reached Chiang Mai our kids were in need of some serious downtime. The boys had gone straight from the last day of school to the airport and then all 3 of them thrown into bustling cities with heat & humidity which they weren’t used to. 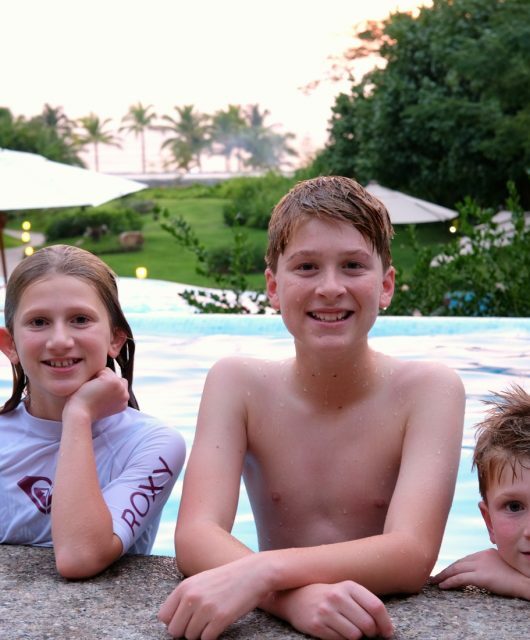 They couldn’t get enough of the pools at the Dhara Dhevi and we were happy to let them swim away. 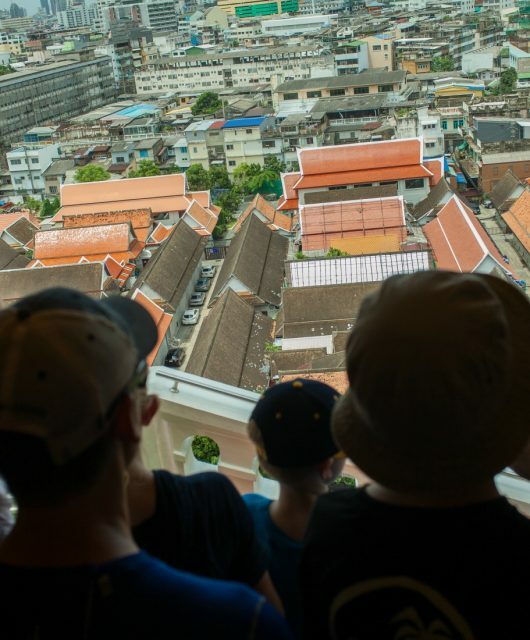 It was a trade-off though….there were things we didn’t get a chance to see & do in Chaing Mai because we spent more time than planned at the hotel, but it was worth it to keep the kids happy & engaged in our trip. Since we were in Chiang Mai on a Sunday we decided we had to check out the Sunday Night Market. It was filled with both tourists and locals alike. There were many food stalls (we all had fried rice & noodles for 180 baht/ $5.5 USD for all 5 of us – our cheapest meal, by far, of the entire trip). There were also stalls filled with handicrafts from local artisans – we were mesmerized by a guy who was blowing glass in the middle of the busy market. And there were souvenirs and tchotchkes – we couldn’t leave the market until my 13-year-old got a glow-in-the-dark spinning top that played obnoxious music. Those vendors are everywhere and followed us around so beware! On our way out of the market, we stopped and watched some locals fire dancing. We knew we wanted to spend about a week in southern Thailand at the beaches. There are so many options – not only towns and islands to choose from but hundreds of hotels & resorts as well. I quickly became overwhelmed by all the choices and had a hard time deciding where we should go. We finally settled on Ko Yao Noi because it was in the middle of all the limestone pinnacles in Phang Nga Bay and was described as being “untouched the way Phuket was 30 years ago”. I went to Phuket in the early 90s with my family and remember it feeling very remote and undeveloped. I wasn’t sure I wanted to go back and see it so built up – I wanted that remote feeling. Although we didn’t see anything in Phuket beyond our drive from the airport to the marina, it seemed a lot more developed than I remembered. Yao Noi was like I remembered Phuket. We flew Thai Smile from Chiang Mai to Phuket where we were met by staff from the Six Senses Yao Noi. They drove us 45 minutes to Ao Por Grand Marina where we had a drink at a restaurant while we waited for our 1PM speedboat transfer which took another 45 minutes. We were greeted at the Six Senses pier by our GEM (Guest Experience Manager) who took us straight to our villa. Our late June/early July trip fell during the low-season since it’s the start of the rainy season in Thailand. While we did encounter some rain, for the most part our days were sunny, or at least partially sunny. Since it’s so hot & humid, cloudy days and the occasional thunderstorm really didn’t bother us. The upside of traveling during this time is that we sometimes felt like we had the hotel to ourselves. The Six Senses is spread out on a hill with lots of jungle growth and is designed to feel remote & private. It was hard to tell how many people were staying at the hotel besides us, but we don’t think there were many. We felt like we ran into the same 4-5 groups of people at meals & at the pool. We had a 2 bedroom villa with a private pool, lots of outdoor deck space and lounge areas, and spectacular views of the limestone pinnacles. They also have ocean front villas, but our villa was so close to the beach (maybe a 2 minute walk) we didn’t feel like we were missing out. We ate all of our meals at the resort because it was an effort to go off property, but we really didn’t mind. For the 3 days we were there, we felt like we had plenty of choices. There was a deli that served free ice cream and cookies all day – they may change that policy after our stay. They had movie nights on the beach, kayaks, SUPs, and a spa where my 11-year-old & I got mother/daughter massages. So many of our vacations revolve around the water – so we were happy to park it at the beach let the kids play soccer, dig in the sand, hunt for crabs and swim. This has got to be the best view I’ve ever seen from a pool. Our kids thought the pool itself was a little bit “boring” as it was on the smaller side, but we were all stunned by the view. We also had a pool at our villa which the kids went in multiple times a day. Definitely one of our favorite activities of the entire trip! Kayaking has become one of our new go-to activities because it’s something we can all do together and it gets us out on the water. 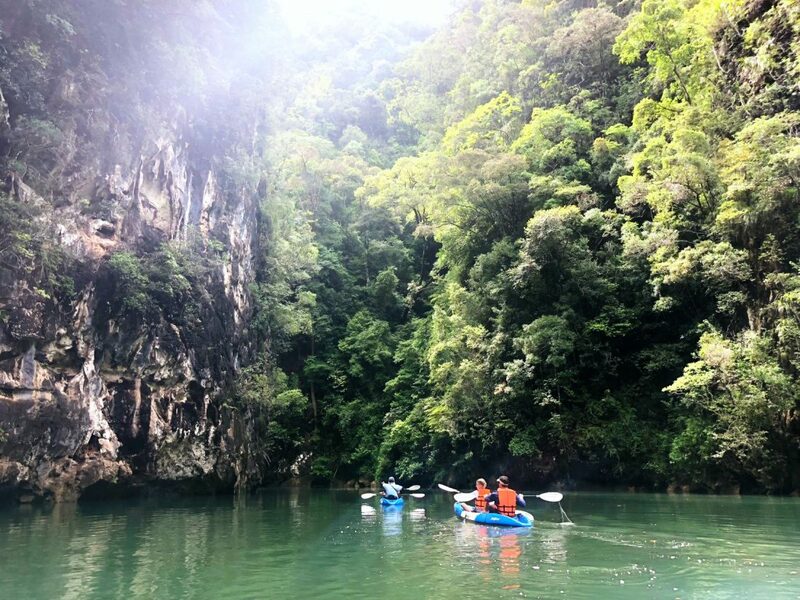 This excursion started off with a 45-minute long tail boat ride across Phang Nga Bay through the limestone pinnacles to a mangrove forest. We landed the boat on a little beach where we got into our kayaks and started our adventure. Each kid was paired up with an adult because it probably would have been too much paddling for our younger kids to do on their own. We hunted for animals in the mangrove forests and stopped to watch one monkey down on the water’s edge for a bit. Our 11-year-old kept trying to navigate her kayak directly underneath the monkey in hopes that it would jump in with her. We navigated down little winding paths in the forest, squeezing through and beneath the tree roots. We also paddled into some limestone caves and under low hanging stalactites. So fun! We really wanted to check out the small town on the island and hoped to take the tuk tuk tour offered by our hotel. Unfortunately, the tuk tuk only accommodated 4 passengers and would not make an exception for 5 of us to squeeze in. They offered to arrange a taxi to take us, but it just didn’t seem as fun. So we got bikes from the hotel and decided to ride the 10k into town. As soon as we got on the bikes it started to rain, but none of us said a word and just kept riding. We followed the one main road as it curved along the island past beaches, restaurants, hotels, gas stations, etc. It reminded me exactly of how I remember Phuket 30ish years ago. As we finally arrived in the town and were excited to look around, an American family in a tuk tuk passing by told us a huge storm was coming and all the locals were heading home. We saw the dark clouds and it was still raining lightly. Since we had a decent ride back we just turned around and left. As we were on the final stretch to our hotel we saw lightening off in the distance and heard thunder. The whole way back I was waiting for a big downpour which didn’t come until we were safely back in our villa (I was slightly disappointed!). We didn’t get any pictures because we turned around too soon, but our 11-year-old wore our GoPro which I’ll post later to show the town. We considered heading to the Four Seasons on Koh Samui or Soneva Kiri on Ko Kut and ended up ruling them out simply due to the logistics. Koh Samui would have required another flight or 2 boat rides and a long bus ride. Ko Kut is over near the Cambodian coast and would have taken almost a full day to get to. 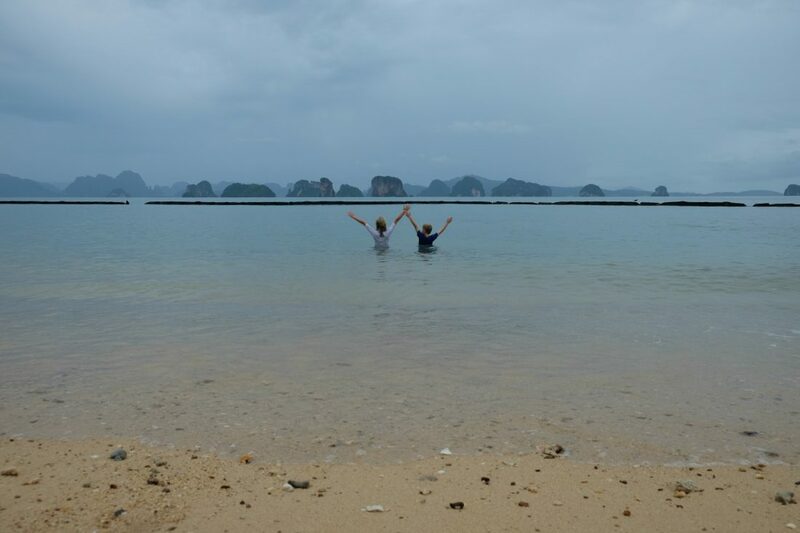 We wanted to maximize our beach time so we chose Krabi which we could see from Yao Noi. We took the Six Senses speedboat to a pier in Krabi and hopped into a taxi which took us to the Rayavadee’s pier (about 30 minutes away). Then we transferred to the Rayavadee’s speedboat which was only about a 15 minute ride. It still took us a couple of hours to get from one hotel to the next, but not having to deal with the airport was a huge bonus. 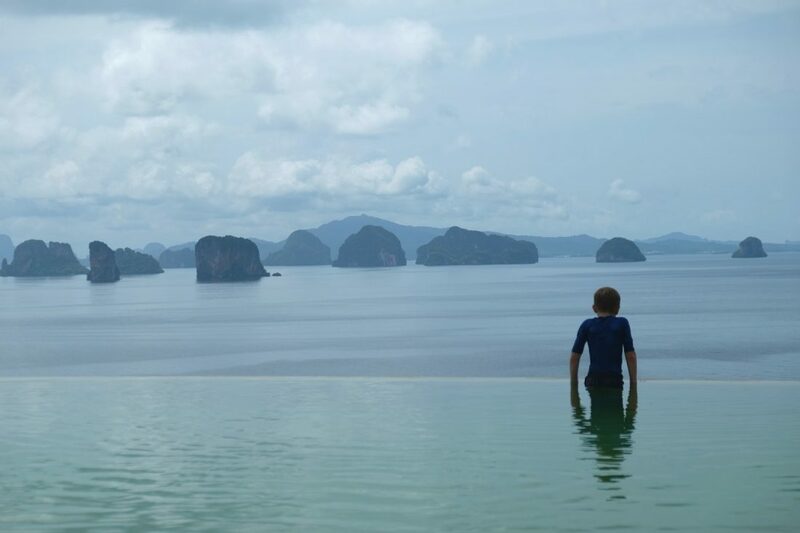 The Rayavadee in Krabi is surrounded by beautiful beaches and limestone cliffs. The hotel’s setting exceeded my expectations – after being surrounded by all the limestone pinnacles at the Six Senses, I wasn’t expecting the Rayavadee to be as good. We still had a view of some of the pinnacles, but what I loved was all the cliffs that surrounded the hotel. There was a huge Bat Cave right past the hotel that completely dwarfed everything. Even one of the hotel restaurants was built into a cave! We chose the Family Villa which had 2 bedrooms plus a single bed in the living room. We also had our own pool which our kids determined was the biggest pool of any of the other villas. We chose the Family Villa because it was centrally located near 3 of the 4 restaurants, 2 of the beaches, the activity center/desk and a relatively short walk from the spa, fitness center, 4th restaurant and main pool & another beach. Another surprise was that our package included a 75-minute spa service for both Mike & I. We both chose the Thai massage again. It was good but not as good as the one we got at the Peninsula Bangkok. We were the only ones to sign up for the hotel’s excursion to the Phi Phi Islands so we essentially got a private tour for the price of a group tour. We left early in the morning on one of the hotel’s speedboats. They took us to several different spots for snorkelling, swimming, and lunch on a beach. They also toured us around the island and showed us Maya Bay (made famous by Leonardo DiCaprio’s movie The Beach). The entire bay was actually blocked off to keep tourists away. Our guides told us that usually, you couldn’t even see the beach or bay because there were so many people and boats visiting every day. 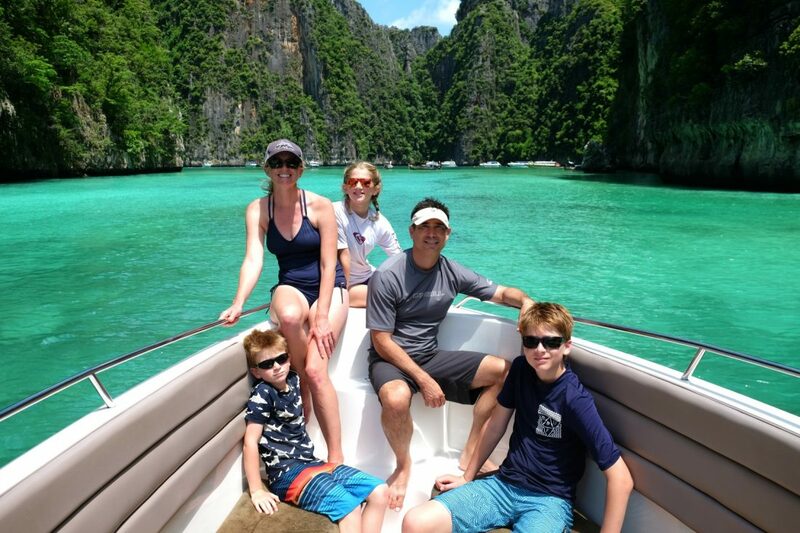 We loved being out on the water, seeing the brilliant turquoise water and white sand beaches, and swimming with lots of colorful fish. The Phi Phi Islands tend to be overrated because they are so crowded, but we were there in the low season when there were still plenty of people, but not so many that it distracted from our experience. We had a great time visiting them for a day. As we approached our hotel by boat the day we arrived, we saw several people rock climbing on the adjacent cliffs. 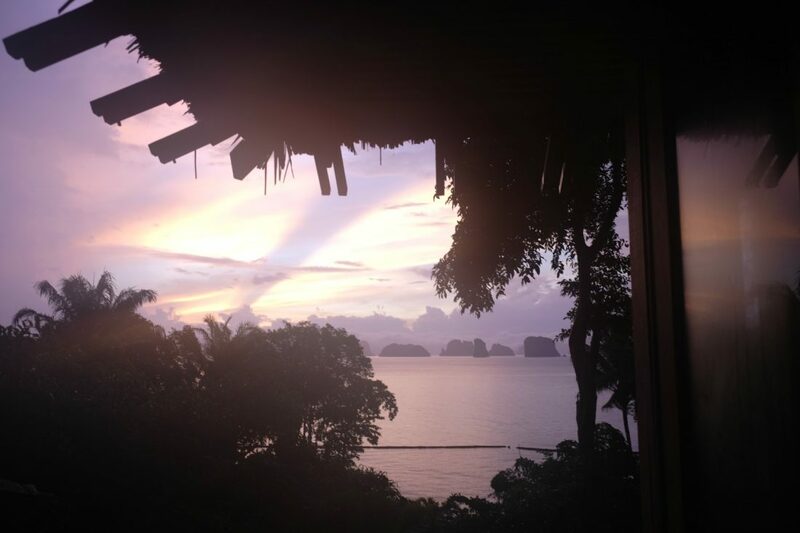 I learned that this is what you do in Krabi, specifically Railay Beach which was right where our hotel was. Our kids have all done indoor rock climbing in some capacity and liked it so we figured we’d give it a try while we were here. Everyone was really excited until we put on all our gear and stood below the towering cliff above us. 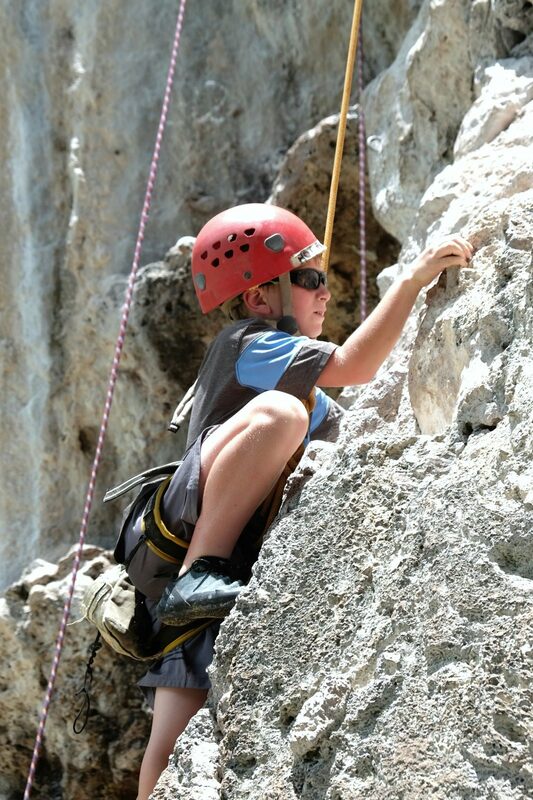 Our 11-year-old was ready to tackle it, but the boys were not so sure. I was questioning my upper body strength and whether I’d be able to get very far (luckily our guide told us to use our leg strength and not upper body or we’d get too tired). Our guides set 2 side-by-side courses so 2 of us could go at once. There were definitely some challenging parts of the climb and a few times I questioned whether I’d be able to make it any farther. But with our guides encouragement and help (sometimes giving us step-by-step instructions on where to place each hand & foot) and the rest of us cheering at the bottom we were all able to make it to the top of both courses. 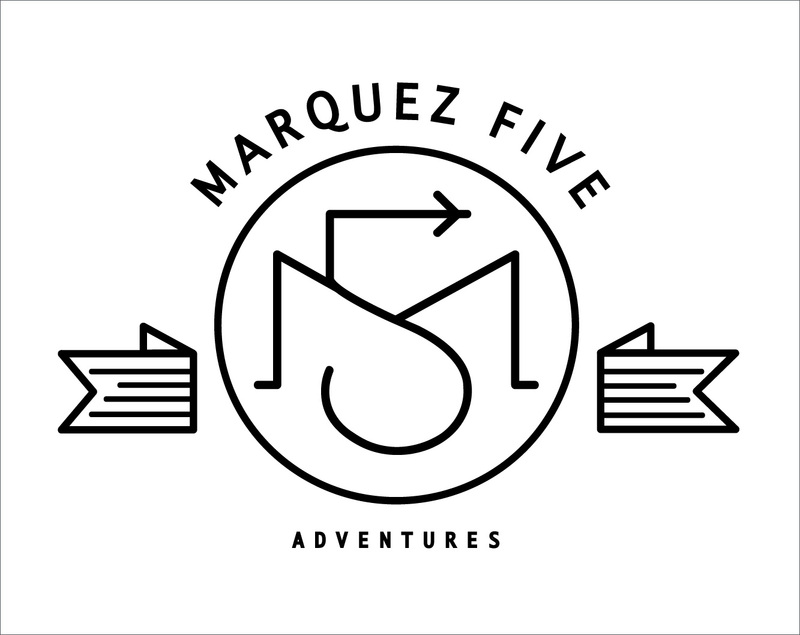 It was really fun to try something new and push out of our comfort zones. I would definitely try it again! The most stressful part of the trip (which hung over me the entire time) was getting from Krabi to Tokyo. We booked a 7:20PM flight from Krabi to Bangkok on Thai Airlines. There were 4 flights on Thai Airlines that flew to Bangkok and we chose the last one of the day. The trick was that our flight to Tokyo left at 12:30AM on ANA and the 2 flights were not connected. So we had to pick up our luggage in Bangkok transfer to the international terminal and check our luggage back into Tokyo. If our flights were on time and we didn’t lose any luggage this would work fine. But I kept worrying that if our flight to Bangkok was canceled and we couldn’t leave until the following day we would miss our flight to Tokyo – since they were technically 2 separate flights and not a connection, it could be a pain to reschedule that flight. Or if we lost a bag in Bangkok, I wasn’t sure how that bag would catch up to us in Tokyo since we would only be there for 48 hours. So, we told ourselves that it was really out of our control and we’d just take a deep breath and deal with any bumps if they came up. In the end, we made both flights with all of our bags. The only bump (literally) was that we flew into a large thunderstorm in Bangkok. It was pouring rain and flashing lightning as we landed. It was so bumpy we all felt sick. All the flights were grounded and the gates full so our plane parked on a remote part of the tarmac and we caught a bus that drove about 15 minutes to get us to the terminal. We were separated getting off the plane and I ended up with the 2 boys on one bus and hoped that Mike had our daughter on the bus that left before us. We didn’t reunite until baggage claim and luckily we were all accounted for. The kids were feeling so sick and none of them wanted to get back on a plane. Luckily by the time our Tokyo flight left the storm had passed. However, our flight to Tokyo had to divert an hour around a typhoon over Taipei – so that flight was only marginally better in terms of turbulence! We stayed at the Park Hyatt in Tokyo. I was so excited for this hotel (where the movie Lost in Translation was filmed), and it really is a nice hotel, but it was probably my least favorite of the trip. We had 2 connecting rooms on the 48th floor with amazing views of Mt. Fuji. The kids loved the high-tech toilets that opened when they sensed motion and were heated with sooo many buttons to push and customize the experience! The pool was nice, but when we went it was set up for lap swimming and didn’t feel very family friendly. I was also disappointed with the breakfast which was the only hotel not to include it in our rate. The buffet was really expensive and not very extensive – pancakes & waffles were separate. I came to understand that sit-down breakfasts are not very big in Tokyo, but this family needs a big breakfast before heading out for the day. The location of the hotel was great. We were a 15 minute walk from Shinjuku which has the biggest train station in Tokyo. We were also close to Yoyogi Park and Shinjuku Goyen Park. Had the weather not been so hot, it would have been a great (but long) walk through Shinjuku Goyen Park to the Meiji Shrine and then on to Harajuku. Instead, we took the metro to the Shrine and then walked to Harajuku. We were excited to check out the tea house and grounds at Shinjuku Goyen Park, but the kids were so tired of walking we opted for the park with a playground across the street from the Hyatt. 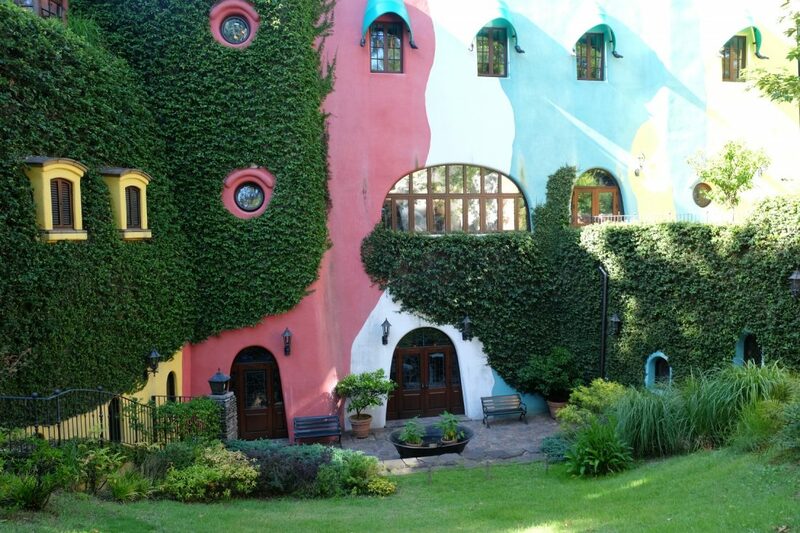 The Ghibli Museum is a whimsical museum dedicated to the Studio Ghibli film studio (think Disney or Pixar) and is behind some of Japan’s most loved animated films. Only our 8-year-old was familiar with one of the films, Totoro, but all of us immediately recognized the characters from many of the movies. Even though we weren’t terribly familiar with Studio Ghibli’s films, we still appreciated the exhibits which were not only dedicated to the Studio’s work, but also to the mechanics of animation which we all found fascinating. Tickets are extremely limited and tickets in July went on sale June 10th at 10AM. I got online at exactly that time (which was June 9th @ 6PM in California). The site did not seem well equipped to handle the traffic and I kept going into a queue and then timing out. I finally got in after about 20 minutes and was able to purchase tickets. I went back about 2 hours later (just to see) and only a few tickets were left for the entire month of July! I thought maybe I was crazy for going on at exactly the moment they went on sale, but I’m glad I did! My first choice was not available so we ended up getting tickets for our first day in Tokyo at 4PM. Once you’re in the museum you can stay as long as you want. 4PM was the last entrance of the day (the museum closes at 6PM) so it was clearing out towards the end of our visit. My only disappointment was that everything was in Japanese with no English translation. While this is completely understandable since we were in Japan, I just think we would have gotten more out of the experience had we been able to read about what we were seeing, especially since none of us was really familiar with these films. Having said that, much of what we saw was self-explanatory (especially the mechanics exhibit) and we could just enjoy all the drawings & films. There was a guided map in English so we were able to find our way around without any problem. At the very last minute, we signed up for a walking tour with Tokyo Walking Tours which I found on Trip Advisor. We settled on a 6-hour tour of West Tokyo which included the Meiji Jingu Shrine, Harajuku District, Shibuya Crossing, and the Tokyo Metropolitan Government Building Observatory. Our English speaking guide, Harumi, met us in the lobby of our hotel at 10AM and we set out from there to the Shinjuku train station. This is Tokyo’s largest Shinto shrine established in 1920 to enshrine Emperor Meiji, the first Emperor of modernized Japan, and Empress Shoken. 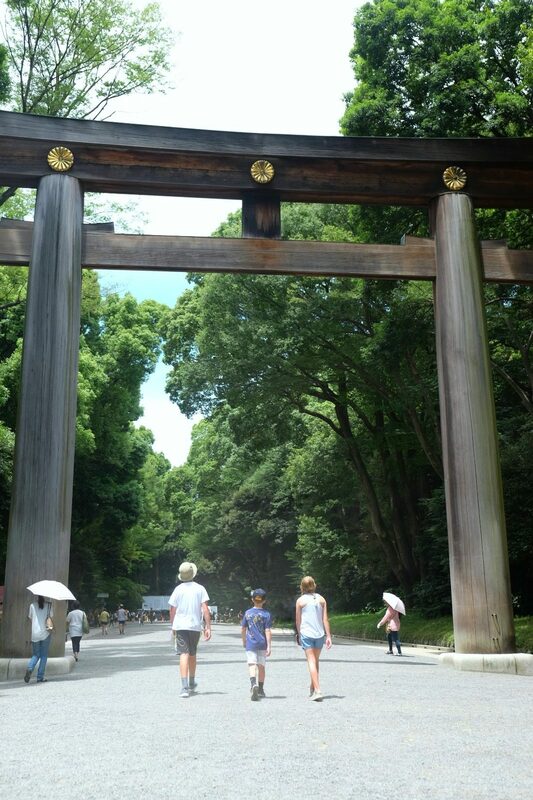 It’s located in a large forested area with large Torii gates. Harumi showed us the large sake barrels that are left as offerings, how to cleanse ourselves before entering the shrine and how to properly say a prayer at the shrine. We also left prayers at the shrine and shopped at the amulet market. The kids were most excited about our stop in Harajuku! 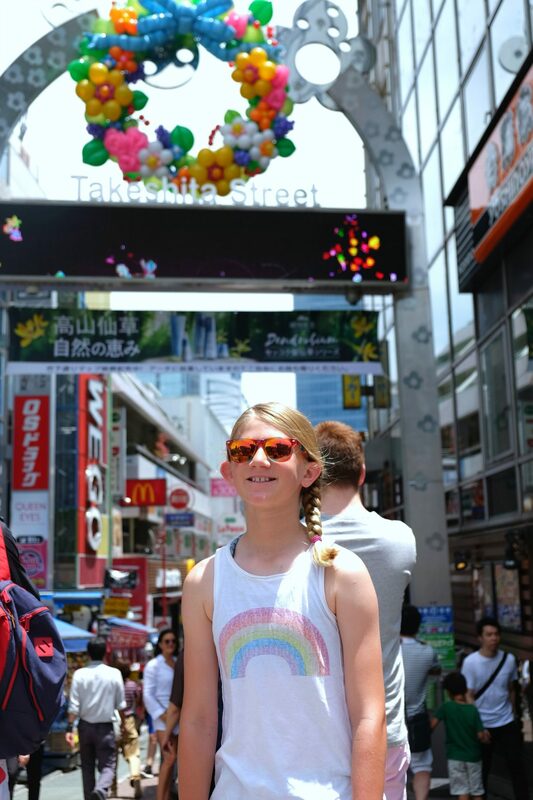 Takeshita Street is internationally known for its girls teen fashion, but all three kids (including our 13 and 8-year-old boys) loved it! They could have spent all day shopping for accessories like squishies, phone cases and sunglasses; toys and stuffed animals; clothes; shoes; and endless food options like rainbow cotton candy and grilled cheese sandwiches (with rainbow cheese)! Harumi showed us some stores hidden up or down stairs that we otherwise would have walked right past and she was so patient as the kids lingered endlessly. Our 11-year-old had a specific request to find pet stores and pet accessory stores and she led us to those as well. 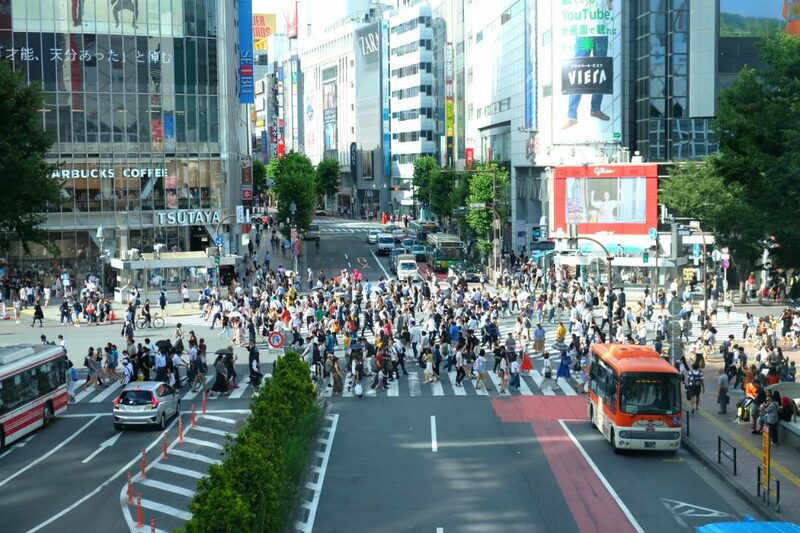 The busiest intersection in the world. We got there around 3PM and it was busy, but not as busy as it would have been around 5PM. Harumi first took us to an overpass where we could look down on the crossing from above. Then we went down and actually crossed a few times. It was fun – not quite as crazy as I was expecting. We also stopped to have our picture taken with a dog statue. Harumi just walked over and got in a long line. We had no idea why people were lined up to take a picture with this statue, but then she explained the story behind the statue and told us it had been made into a movie, “Hachi” starring Richard Douglas. None of us had seen the movie, but as soon as we got home we watched it and are now glad we have the photo! 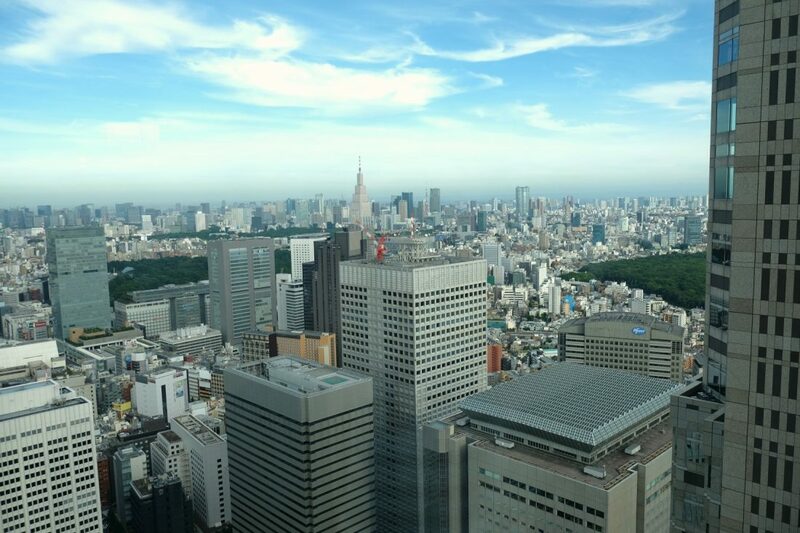 Our last stop was checking out the views from the observatory at the Tokyo Metropolitan Government Building. There are 2 towers: north & south. Harumi said her favorite is the south tower because it’s usually less crowded and the way it’s designed, there are 360 degree views. The north tower has a cafe on one side that blocks some of the views. The day we went, the south tower was closed so we went to the north tower. We were there on a clear day and Harumi pointed out different areas to us: Mt. Fuji, Tokyo Tower, Tokyo Skytree, parks, etc. The most amazing views are from the Tokyo Skytree, but that was far from where we were and we just didn’t have the time to make it there (even though that was one of the things our 13-year-old really wanted to do). The Tokyo Tower was closer, but we felt like we had our fill of views from the Government Building (which is free) and our hotel. So, what did we miss? What are your favorite things to do that we should be sure to see next time? Also, I’m going to write more in-depth posts on some of these activities and link to them from this post – if there is anything in particular you’d like to hear more about let me know and I’ll be sure to include it! Super! Great overview of Tokyo to prepare us for our trip! Thanks Annika!I can’t wait to hear all about your trip to Japan!